I followed very closely your article La statuette de Louis-Philippe par Pradier: une énigme élucidée? regarding the cast iron sculpture of Louis-Philippe by Pradier (bravo for having found it on Ebay!!!). Your observations were extremely instructive, and I thank you for them. 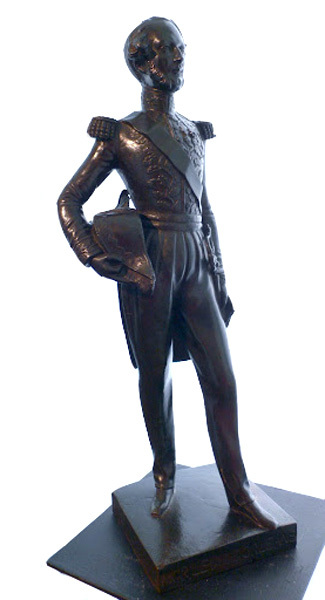 As a point of interest, and to shed another slender ray of light on the production of Romantic sculpture in this rare medium, I thought it might be of interest to bring an exquisite standing figure of the duc d'Orléans which we recently acquired to your attention. The sculpture was originally found in the south of Holland (of all places) and we purchased from a dealer in Amsterdam. Having owned and sold many years ago a superb example of Barre's Duc d'Orléans by the founder Eck et Durand (from the personal collection of the Comte de Paris), we were overjoyed at the prospect of having found yet another one. On closer inspection, it became clear that despite the extraordinary quality of chasing and modeling, the work was not in bronze but in iron, and that it was not by Barre, but by some other very good sculptor (as yet unknown). The finesse and execution of this work defy description. The photos below (see also our album on Picasa) do not do it justice, because they give it a strange hue. It is not very easy to photograph a solid black object, as you can imagine. Suffice it to say that the work is magnificent, and in a remarkable state of conservation. Not a single sign of rust to be found anywhere. Our gallery recently enjoyed the visit of Isabelle Lemaistre. She affirmed that the sculpture was a tour de force of casting, and marveled at its beauty and the care and attention of its finishing. As for its origins, she was as much at a loss as we. The work is neither signed by its author, nor is there a foundry mark (which we all found to be extremely odd, given the effort and mastery that went into its making). Madame Lemaistre suggested that since iron casting was a German specialty rather than a French one (this is quite true, because we once had a pair of Schinkel candlesticks, which numbered among the most beautiful cast objects we have ever owned), the sculpture had something to do perhaps with Princesse Marie's departure to the Mecklinburg residence in Wurtemberg in 1837. At that time her household might have included portraits of her family in plaster, which she subsequently had realized in iron, since that was a local specialty. The refined facture and lack of identifying marks would support this hypothesis. If the theory can be verified, it would give a clue as to why the statue found its way to Holland, and help to explain the origin of your Pradier Louis-Philippe as well. There is evidently much to be learned with regard to this branch of nineteenth-century sculpture. Every example which turns up contributes another piece to the puzzle. By the way, the iron has a delicate green « jus » applied to it, par si par là, which may have protected the metal from the elements (a nineteenth-century anti-rouille of sorts), or it might be the suggestion of a patina. Whatever it is exactly, it gives a beautiful nuance to the surface - but none of this will be evident in the photos, I fear. If you have the slightest idea as to who the author of the sculpture might be, we would be extremely grateful to know it. We checked through all the names in Horst Janssen's Iconographic Index to the Lami Sculpture Dictionary, but it doesn't appear to be any of these. Prompted by a recent communication, reproduced below, Madame Lemaistre graced our gallery with a visit yesterday. It is true that the appearance on the market of sculptural portraits of Marie d'Orléans is something of an event, given their rarity. 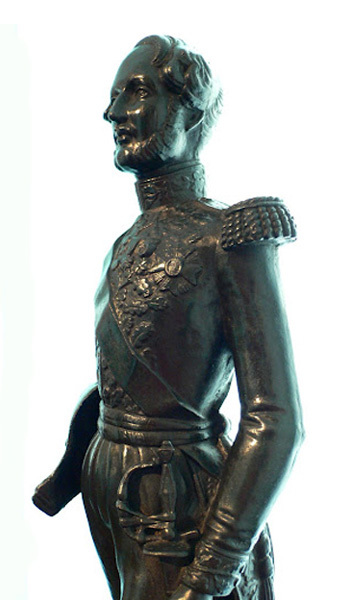 As we suspected, the casts, pictured below (as well as the other example of the Duc d'Orléans in iron, acquired some time ago, which we described above), are the only known examples of the models located at present. Information regarding iron production in France is limited, and scattered. Yet this medium, which was taken very seriously and achieved a vogue in the 1830s and 40s, deserves greater attention. Madame Lemaistre pointed out, as a case in point, that Hittorf's fountain for the Place de la Concorde was originally made of cast iron, before problems of rust obliged the substitution of bronze replacements! Not long ago, I remember having read with pleasure your article on a cast iron statuette of Louis-Philippe. I consulted the Pradier site a few days ago, but alas, the article has disappeared. Would it be possible for you to send a copy of it to us by email? We would be extremely grateful if you could. 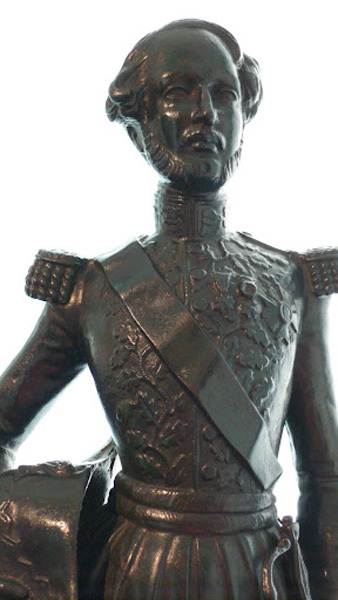 You will perhaps remember having seen at our gallery, some time ago, a statuette in iron of the Duc d'Orléans. 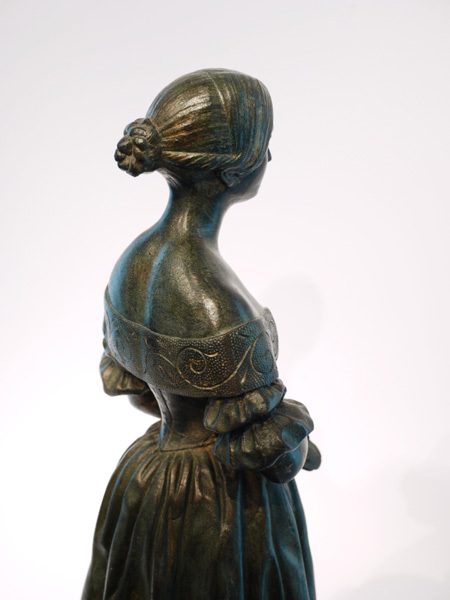 Due to the fine quality of casting and the fact that the sculpture was located by us in Amsterdam, you suggested the possibility of a connection to the marriage of Marie d'Orléans and the subsequent move of her household to Germany. Mirabile dictu, We have just acquired the very same model in iron from an old Parisian collection, but this time it is one of a pair! The other sculpture is a portrait of Marie d'Orléans! Bravo, then, for your wonderfully erudite deduction! 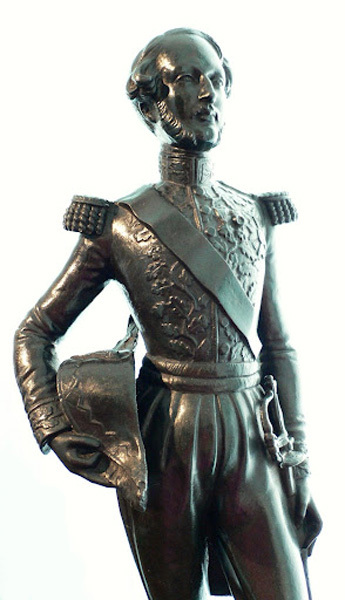 The two recently acquired sculptures, measuring 46 cm, are of much finer quality than the first Duc d'Orléans that we found. The surfaces are more detailed, and the chasing more delicate. In addition, the title of the sitter (Mgr. Le Duc d'Orléans) is not engraved on the self-base of this example, which may indicate that it was not produced for wide dissemination, but rather destined for someone who knew the sitters well (perhaps someone in the family circle?). The patinas appear to have been parcel-gilt, since they are enriched with traces of gold (and perhaps even silver leaf), overlaid on a greenish-black patina. In short, great care was exercised in their finishing. 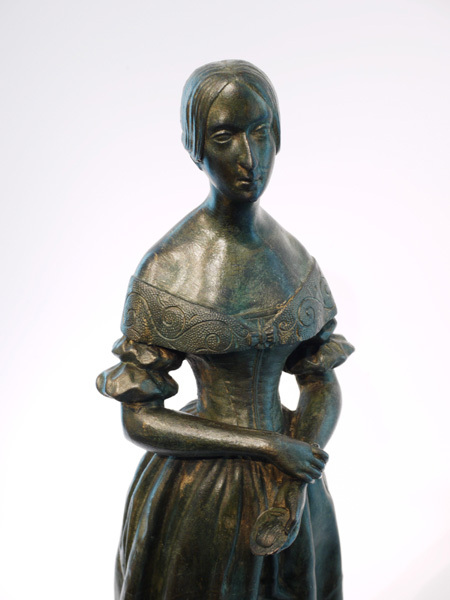 Marie d'Orléans is represented holding attributes that indicate her passion and talent for sculpture: a medal in her right hand (a profile of the head of Joan of Arc?) and a stilus in her left. The duke is decked out in full military regalia, and as you so rightly pointed out, while this portrait does not fully conform to Ingres' famous painting, it comes very close to it in spirit. Might the unusual medium of iron indicate that the statuettes served as a symbol of mourning, given the inhabitual pairing of two of Louis-Philippe's children linked by the tragic destiny of their premature demise? We are scratching our heads as to who the author of these works might be. We have the impression, given the subject matter and the style (and the inscription in French on the first example of the Duke), that they are by a sculptor of the French School. 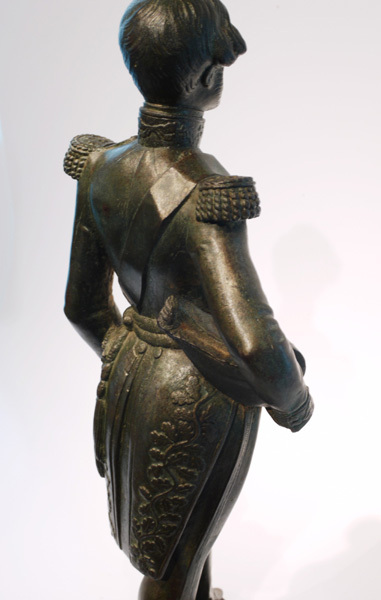 Douglas Siler published a fascinating article on an iron version of Pradier's standing Louis-Philippe on his website. Other than this, though, we know of no other attempt to come to grips with French Romantic sculpture in cast iron. While admittedly limited in scope, the subject is a terra incognita that may deserve further investigation. Nota bene: the attached photos were lightened to show surface detail. The patinas are in fact darker, much more subtle, and the nuances not so contrasting. By the way, if you have any idea regarding the authorship of these unsigned works, we would be very happy to hear it. All we know, so far, is that they are by a very good hand. Princesse Marie holds a medallion, which Madame Lemaistre believes may be the portrait of her son. If this is indeed the case, the sculptures would be late, or even posthumous. The odd pairing of the Duc d'Orléans and the Princesse Marie, as well as the medium of iron, often reserved for memento mori, also suggest that the works fall into the latter category. 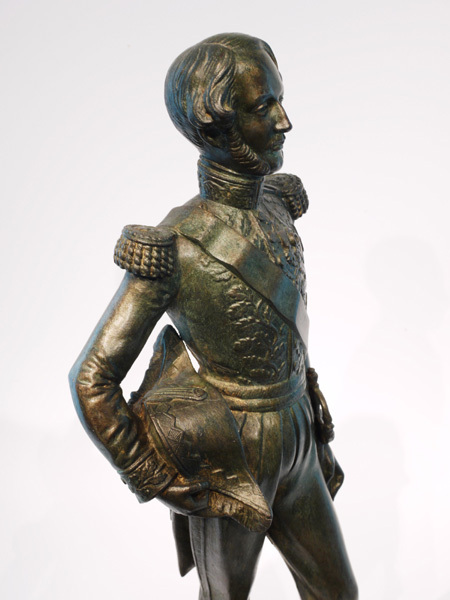 I read with great interest your messages about the cast iron models of the duc d'Orléans and of his sister Marie. Unfortunately, I have no idea, either, who the sculptor might be. Pradier's duc d'Orléans is different and I don't believe there is any record of his having made a portrait of Marie d'Orléans. 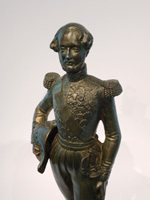 Thanks for letting me know that my article on the Louis-Philippe statuette had disappeared from my website. This was entirely unintentional and due to a technical error. I have just added it back to the list of articles en ligne. If you think it’s worthwhile, please inform Mme Lemaistre that it is once again online. Je pense qu'elle [la famille royale] ne regardera pas à cette dépense pour avoir en petit le portrait du Roi leur Père, etc. En le mettant au prix d'un buste en marbre je pense que ce sera peu de choses pour tous les membres de cette famille. Ayez donc la bonté, cher ami, de faire voir au Roi cet ouvrage et lui demander, en lui offrant cette épreuve, ses ordres à ce sujet. J'attendrai avant de la mettre en public et qui en voudra paiera 100 francs. Alors en viendront chercher ceux qui en désireront à ce prix modique. which shed light on the commercialisation of his works. As I mentioned above, we possess two examples of the Duke of Orleans in iron: one of very fine quality (without an inscription), and another of lesser quality (with the sitters name engraved on the self-base.) We surmised at the time that the former was meant for a family member, and the latter for larger distribution. The patina of the « deluxe pair » of brother and sister have a greenish patina and appear to be parcel gilt. Whether this gilding is period or was added at a later time, as Madame Lemaistre pointed out, will have to be determined through laboratory analysis. It was also interesting to note that Pradier produced large works in iron, the Amazon for the Cirque d'Hiver and the Mascaron of Nepture at La Malque, confirming that the great sculptors of the period were not adverse to take on the challenges that casting in iron posed. → Étude: La statuette de Louis-Philippe par Pradier: une énigme élucidée?